I have just returned from taking 25 Wah Lum members on a tour to China. In the early days, my father would take groups annually, or at least every other year. Now, with the economy, time constraints, etc. we do not visit nearly as often. 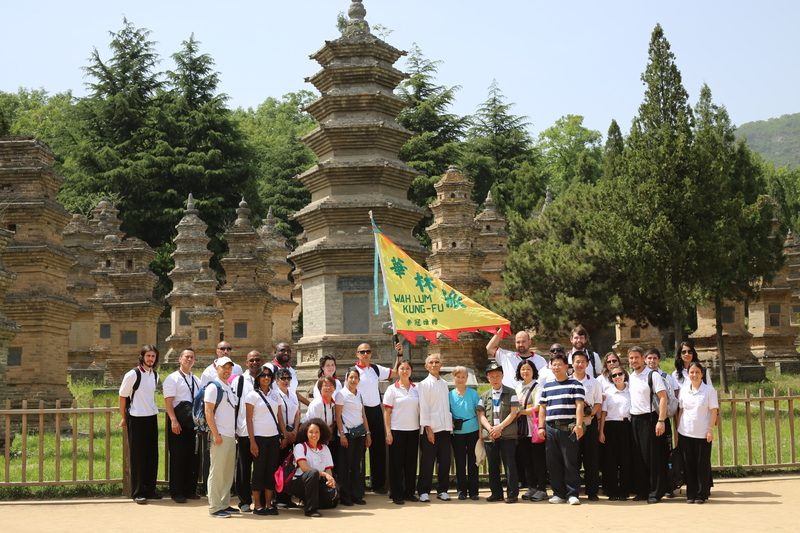 Our goal for the trip is to expose students to the culture and history of China. We show the sights and rich history that China has to offer, but as martial artists, we mainly we go back to see where the roots of our style began. Specifically for Wah Lum members, it is like a pilgrimage to the origins of where Wah Lum began. Grandmaster Chan has developed a long standing relationship with delegates, masters, and friends in China. He is always welcomed with very special treatment — but this trip was exceptional. Grandmaster Chan is a 33rd generation disciple of the Shaolin Temple. The current Abbot Yongxin is his Buddha brother and they shared the same master. The Abbot welcomed the entire group with open arms into the Temple, and into his private chambers to discuss martial arts history with us. He served us tea and presented each member with a copy of his newest book, Shaolin Temple in my heart. We all felt deeply honored. We then proceeded to the martial arts exchange. We watched a fantastic display of Shaolin kung fu by the temple monks. Then it was our turn to perform to share our Wah Lum style with the monks. 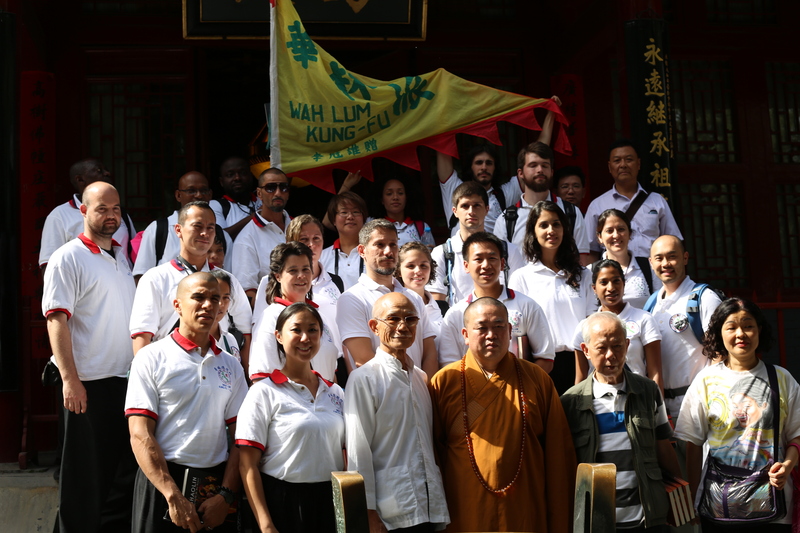 We also visited another school in the Shaolin district, Shaolin Epo Wushu College, headed by Grandmaster Liang. Grandmaster Liang was a part of the first Shaolin Monk tour to the USA, that my father initiated (along with Grandmaster John Leong). They have maintained a very close friendship since that time, so we bring our students to train at their incredible facility. There are over 8000 students studying Shaolin Kungfu in their college. It was quite a sight to see! The students enjoyed the warm welcome we received and the special performance of the dragon and northern lion dance. All the students were also welcomed into Grandmaster Liang’s office and given a gift of Buddha beads that had been blessed by monks. Oscar and I were also formally welcomed into the Shaolin family. We conducted a traditional tea ceremony and served Grandmaster Liang tea, to represent our family relationship as his extended family (almost like Godchildren). We also formed a special relationship with Grandmaster Liang’s son and successor Liang Shaozong, as it is understood we are to keep the bridge strong between Wah Lum and Shaolin Kung Fu in China. Quite a responsibility and undertaking, but we are both very honored to be given the task. Beijing, Zhengzhou, Louyang, Xian, Guangzhou, Shajing, and Hong Kong — The sights, tours, food, and the kung fu training was all wonderful. However, there was one day on our 17 day trip that truly stands out. Shajing. It was probably the highlight for all martial artists on the trip. Shajing is my father’s hometown village. If you watched the movie Pui Chan: Kung Fu Pioneer, you will remember the warm welcome he always receives when returning to Shajing. Many old friends and kung fu family members come out to see him at the Shajing community center. However, the welcome we received went ‘above and beyond’ anything we could have imagined. The day started at Grandmaster Lee Kwan Shan’s memorial. Many of the kung fu cousins and siblings came out to bisan (light incense) with us and pay respects. Seeing a line of almost 100 people along the graveside to pay their respects to Grandmaster Lee Kwan Shan and my ancestors gave me chills (and it was about 100 degrees). They even had a whole roasted pig for the occasion! Then we visited the Shajing community center where photos and accolades of Shajing natives (including my father and Wah Lum) decorate the walls of the center. Shajing has grown immensely, and now has an oyster farm museum. We were all intrigued to see the museum, which proudly displayed our movie poster! ed us as we marched into the temple to pay our respects. Speeches were made thanking Grandmaster Chan for returning to Shajing and congratulating him on his many accomplishments. My father, Oscar, Young Goo (Chan Wan Ching’s sister), and I exchanged gifts with the dignitaries, then the kung fu began! Per tradition, our members and their members exhibition together as part of the cultural exchange. It was so inspiring to see the ‘older’ generation (men 60+ years old) come out and display forms like Fan Cha, Big Mantis, and even Kwan Do! I was inspired. I was moved. I felt honored to be a part of Wah Lum. It was by far the best reception we have ever received. Being in China, I am reminded of where Wah Lum began, how far we have come, and how much further we have to go. Wah Lum is has a rich history and strong traditions. Several generations of Wah Lum students have returned to the roots of where Wah Lum began. I think it is essential for us to remember where we came from, and I hope students realize the sacrifices and dedication it took to keep Wah Lum going today. I hope that the tour members see that the special treatment they received on tour is only due to Grandmaster Chan’s hard work over the years to develop relationships that have lasted a lifetime. Because of Wah Lum, we were able to experience China in a unique way. Even though I have been several times, this visit felt different. Standing in the town where my father once lived with his family, oyster farmed, and trained with Grandmaster Lee Kwan Shan was inspiring and exciting. Even though the journey to China is far, I think it is important that we make that journey as often as possible. This visit reminds me of why I continue to teach today. Wah Lum is a deeply rooted tree with many branches. Some branches fall off and die, others grow and flourish. I feel fortunate to be a part of the tree that will keep the traditions of Wah Lum Kung Fu alive.